I recently changed this blog’s theme for the third time since launching it, and I have helped several clients and friends to start a blog in the past. Over the years, I have learned a bit about choosing a theme for a WordPress blog. I always ask my clients to think about the following questions before doing a design brief or buying a theme right away. In this post, I want to outline what these questions are. A theme is not only the layout or design for your blog, it has much larger implications on your blog. It defines large parts of the user experience on your site. How the navigation works, how specific content types look, where you can display widgets with content, how you can integrate third-party apps or services, etc. Often people think only about the design of a blog when looking at WordPress themes, but this is only the first impression. Choosing a theme is not only a question of design but also of user experience, content structure, and customization. The Theme Directory on WordPress.org lists over 2000 themes. The web changes so fast that trends for blog themes come and go. Before jumping right into choosing a theme for your blog, surf the web and get inspired. Do not look only at the blogs of your competitors but ask your peers what blogs they follow and why they like them. 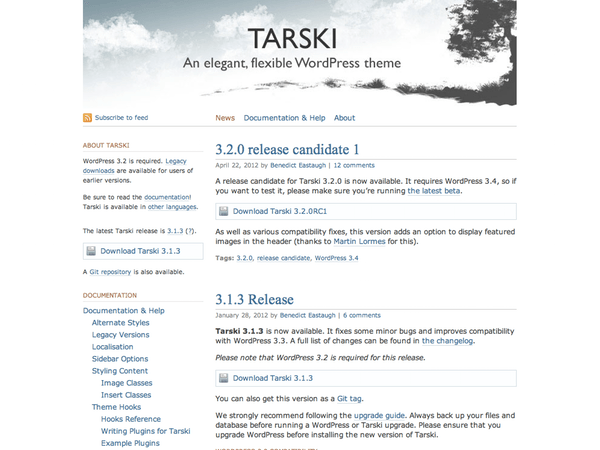 Screenshot of the Tarski theme. How blogs looked not so long ago. Multiple Author or Single Author Blog? Depending on whether your blog is written by one person or has multiple authors, you will want to look for different elements in your theme. 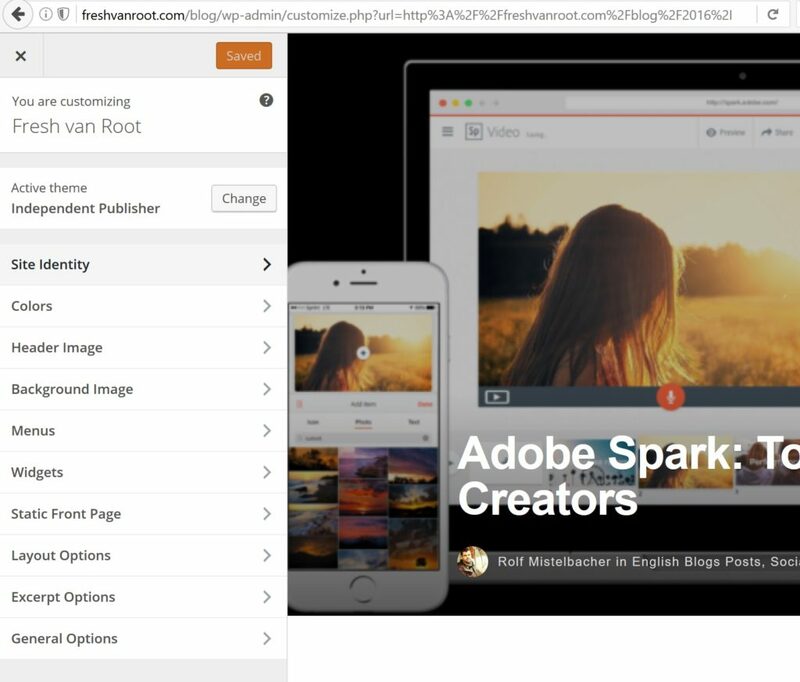 Having multiple authors means you would like to clearly show which post is written by whom and to host an author landing page showing more details about each author and links to social network profiles of the individual authors. If you run a blog as a single person, you potentially don’t need these features. Having multiple authors may also bring the request to manually set featured or top stories, which are not related to the publish date. Single author themes often just have the option to set one sticky post. Having multiple authors means more content, so a simple chronological order like on this blog perhaps is not suitable, and you may want something that shows lots of articles in a grid view. Magazine layouts also come with features for displaying posts by popularity, author, or category. 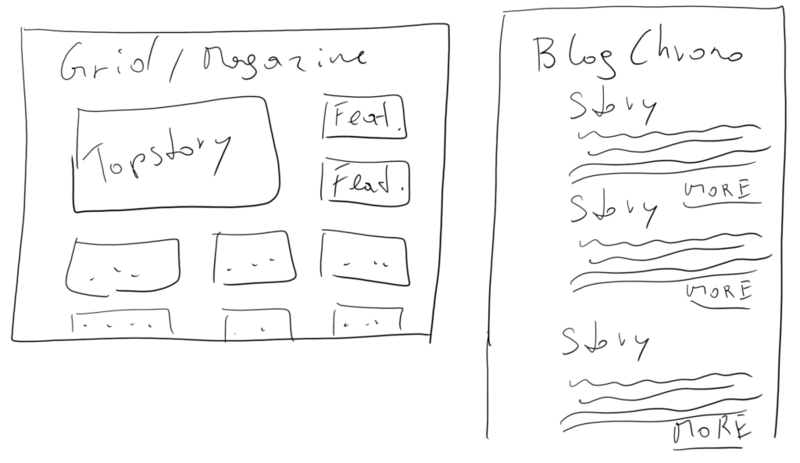 Scribble: Magazine layout vs. chronological list of Posts. How Well Does It Fit into Your Other Digital Content Activities? This question is about theme customization. The basics are easy to change in most WordPress themes, like font and link color and the logo and navigation options. If you run several other websites, you may want to check how well the new blog integrates from a branding perspective. Choosing a theme with a completely different concept for navigation, content structure, etc., may not be a good idea. Using the same font, font size, and logo is a good start. Also, how do you plan to link to the blog and integrate its content into other channels? Is a text link displayed on your shop or corporate page enough, or do you want to sync content (but this could be solved by your blog theme)? Before you launch your blog, you should think about how to integrate it into your other marketing channels. Before choosing a theme, you should think about your content strategy, what you will blog about, and how often you will publish content. During this thought process, you will also think about the format you want. The easiest is text with pictures, and basically all themes support that. It gets a little trickier if you want to publish podcasts, lots of picture galleries, integrate third-party embedded objects, etc. I did a podcast series about Austrian startups. The audio interviews were published on SoundCloud and then integrated into my blog. I looked specifically for a theme that allowed me to integrate the SoundCloud player object right into the featured area of the post. Longform articles need different approaches, as do photo blogs, food blogs, fashion blogs, etc. What are you looking for in WordPress concerning page templates and post types? When choosing a theme, check out the different options on how to categorize a post from a content perspective and how you can customize the front page of your blog. 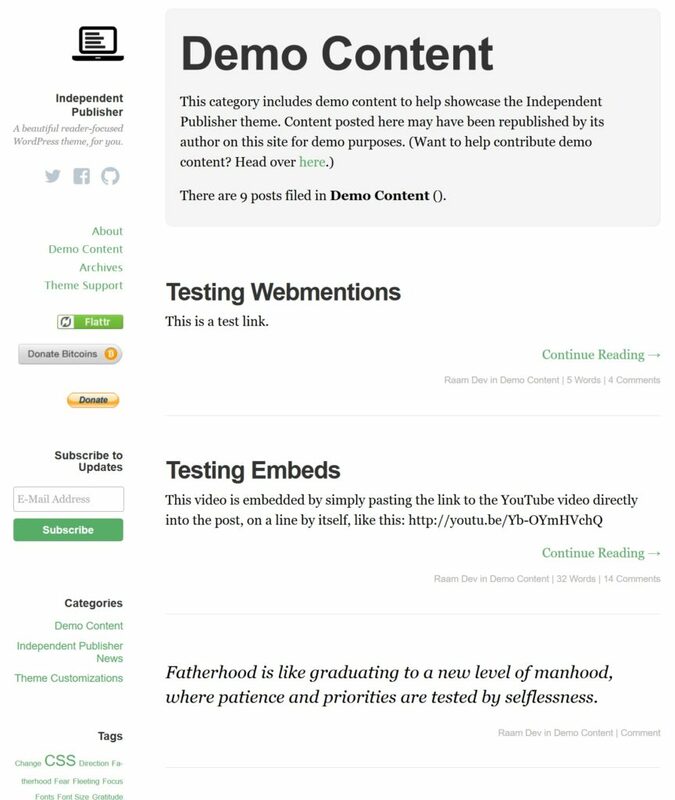 The demo content page from the Independent Publisher Theme (in use on this blog). If you need to use specific plugins, how do they work with the new theme? Do you want to show widgets with content from other pages, or social network follow buttons, search boxes, or other information? Does your chosen theme support this? The more options a theme gives, the more complex it becomes. Does the theme you want to use need the installation of lots of other plugins? Then, re-evaluate because plugins can slow down your site and you will have to update not only the theme but also the plugins in the future. Theme customization view for the Independent Publisher Theme. Take a step back and take the reader’s perspective. Of course you want visitors to appreciate your content, to come back often, to get in touch with you, and to leave comments. However, try to narrow this down to the simplest question at the beginning: How good is the experience of consuming content on your blog? A good way to see the blog from the reader’s perspective is to set up a test site and create a few posts, which you will need anyway for launching your blog (and as a playground for your editors). Try to have several posts with different types of media. Then, take a look from your mobile device and desktop tablet and check if the visitor experience is great. Additionally, play around with different themes and functions and potentially ask others to give feedback. This is common sense: Mobile Internet consumption is growing, especially content consumption, which is very easy to access from your smartphone while on the road. Heavily check your theme to see how it performs on a mobile device. People involved in choosing a blog theme often browse themes while on their laptops during classic office hours and are blown away by how many good options are available, but on mobile devices, lots of themes don’t perform well (not much space for fancy elements). The reader’s experience is much more important on that device. 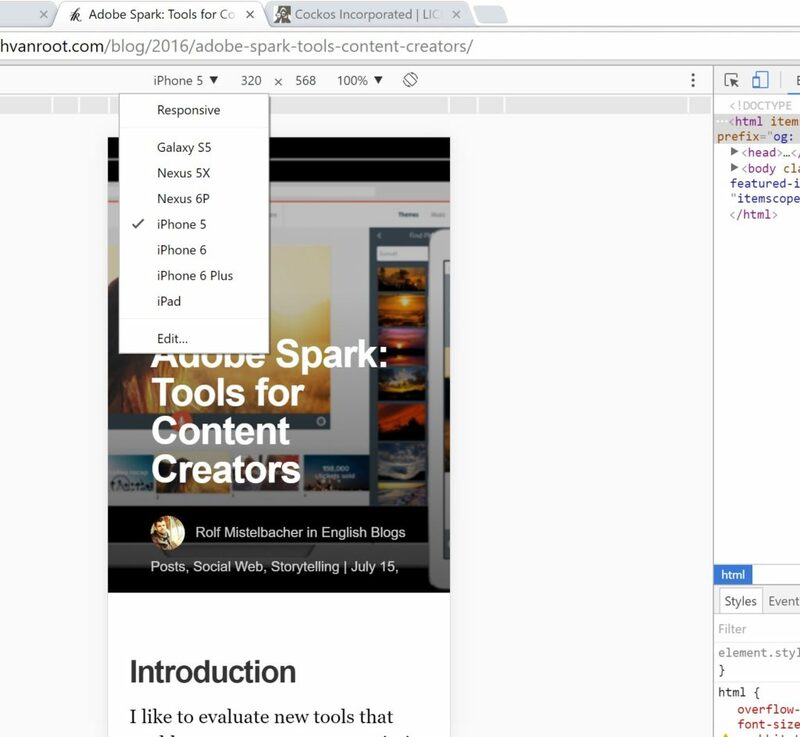 Google’s chrome browser allows you to view a website from different device perspectives. Press F12 and then the device toolbar to see how your blog theme Looks. Changing themes in WordPress or other CMS has become much easier over the last few years. Changing it at a later time is not that difficult. You may start out with a different mission than you first planned or you may produce less or more content than expected, so the requirements for how your blog should look change. Start with a simple chronological look, then adapt to a magazine look. As for every website, blog design and layout can be tweaked and tuned as long as you publish content on it. Depending on how you answered some of the questions above, you can check if a pre-built theme would support your needs or you may want to go the way of creating your own fully customized theme from scratch. 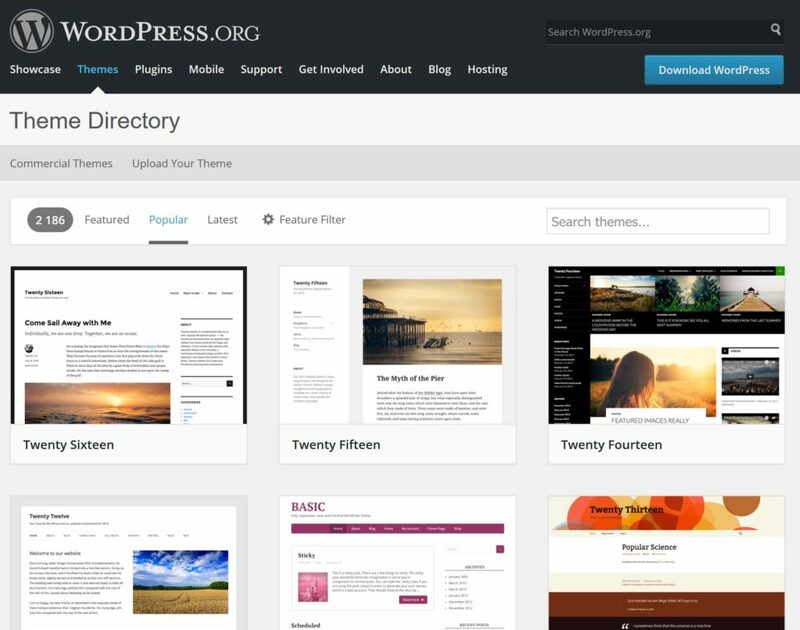 Choose a freely available theme from WordPress.org or WordPress.com. If this is your first blog project, and you don’t want to invest too many resources, check all the freely available themes. This blog launched with the Pachyderm theme, and now is running the Independent Publisher theme. Both are available for free. Buy a pre-built theme on a marketplace like ThemeForest or Template Monster ($$). Be sure to check the ratings, support options, and the date of the last update to avoid choosing a theme that is no longer supported. Build your own from scratch ($$$). This means sitting down with a skilled person who will take a look at your brands CI and the answered questions above and give you a detailed offer and pricing. This ranges from a few hundred bucks to thousands of dollars or euros. Or you can code the theme on your own. If you need an agency to help you get your company blog set up, email us at office[at]freshvanroot.com. We help you to work through all the necessary stages before launching your blog and will support you over the first few months to ensure things run smoothly.